Unlike the other series I'm reviewing in this project, I've actually sat through all of Deep Space Nine. It was my absolute favorite of the Trek series and hooked me from the very beginning. The tone on the show was different. The fact that it wasn't just yet another show set on a space ship, traveling the stars, gave it a chance to tell very different stories. Sure, not every episode was a winner, but so many of them were great that I just had to watch it from start to finish. Of course, that changes the rules of the game for us here. Picking five episodes to watch for the show doesn't matter as much when I've seen all of them and could probably review them all without even needing to watch them again. Although I will, because any excuse to watch Deep Space Nine is one I will take. I've gone over some best of lists and chosen the five I want to talk about, so that's what we'll do. That said, we still have some rules to follow. As before, we're sticking to (1) No Tribbles (killing one episode), (2) No Mirror Universe (which cancels out a lot of episodes in this run), (3) No Q (I recall he shows up at least once), and (4) No Two-Parters. Instead we'll once again try for some of the deeper cuts to show what Deep Space Nine could really offer. While I can trust that you are likely familiar with the general story of The Original Series or The Next Generation, that's because the plot of the show is essentially outlined in the opening monologue of every episode: "To explore strange new worlds. To seek out new life and new civilizations. To boldly go where no one has gone before." The mission of the two shows (three if you also count The Animated Series) is to explore and whatever happens, happens. Deep Space Nine, though, had a different premise, and there was no handy opening monologue to explain it. In the first episodes, we're introduced to the titular space station which, at one point, was a Cardassian base in orbit around Bajor. As we know from Next Gen (of which two of the wpisodes we watched for this project, by sheer happenstance, touched upon this), the Cardassians invaded the Bajor system some 40 years ago. They occupied the primary planet and, essentially, enslaved the Bajoran people. Why would Cardassia do this? Because Bajpor sat near a natural recurring worm hole, granting fast-travel to the Gamma Quadrant of the universe. That prize was too useful to pass up. In recent times, though, the Bajors threw off the yoke of their oppressors and took back over their planet. They then invited the Federation to their system to act as a kind of mediating force, a group to ensure Bajor remains free. However, not everyone in Bajor is happy with this arrangement. Some view the Federation as just another occupying force, another group of aliens that have come to Bajor to dictate how the Bajorans will live. This sets up a couple of the different conflicts that would fuel the early seasons, namely the cold war between Bajor and Cardassia as well as the constant distrust of the Federation's motives. Of course, later seasons would tweak this formula some, first by introducing the Defiant, a small, very powerful, Federation ship assigned to the space station under the control of the Federation commander (and eventual captain), Benjamin Sisko (Avery Brooks). Then, later the show would explore an alien race of empire-building shapeshifters from the Gamma Quadrant, the Dominion, and the eventual war with that group. This eventually created a long, serialized story in the middle of a Star Trek series, something the franchise hadn't really don't before (outside of the loose trilogy of movies, parts II, III, and IV). 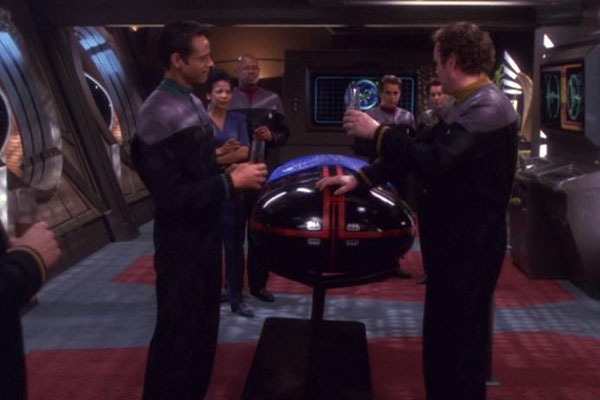 Along with Sisko, the first black commander on a Trek series, the show also included: science officer Jadzia Dax (Terry Farrel), an alien with her own symbiotic alien living inside her, creating a shared consciousness; medical officer Julian Bashir (Alexander Siddig); Engineering Chief Miles O'Brien (Colm Meaney), a carry-over from Next Gen; and, eventually, tactical officer Worf (Michael Dorn), another Next Gen carry-over once that series ended. On the Bajroan side, the space station had: Major Kira Nerys (Nana Visitor), second in command of the space station and a one-time leader of the Bajoran resistance, as well as Chief Security Officer Odo (Rene Auberjonois), a shapeshifter with no knowledge of where he came from. The space station also had a few merchants such as the Quark (Armin Shimerman), the Ferengi bar tender and casino owner, and his brother Rom (Max Grodenchik), as well as the tailor, Garak (Andrew Robinson), a Cardassian with a secret past (who probably worked for the Cardassian high command before being excommunicated for some reason). 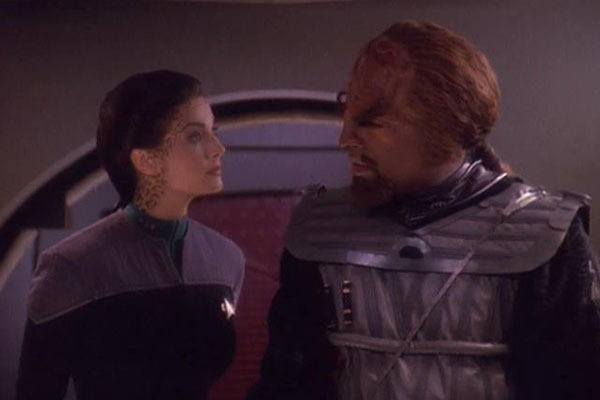 On board the starbase, Major Kira gets a message from the Bajoran archives, as someone with the archive would like to ask Kira about her time in a Cardassian prison camp. However, Kira has no memory of ever being in a prison camp, and yet the records clearly indicate she was there. She clearly remembers she wasn't there, but when questioning other inmates, they all remember her. So Kira heads off to Bajor to get to the bottom of the mystery, but then she disappears, only to wake up later at a Cardassian home. And she has a Cardassian face. The Cardassians tell her that she was actually an infiltration agent and that the Kira she thinks she is doesn't exist. Are they telling thr truth? Is Kira really a Cardassian? To be frank, this episode wouldn't have been on my personal "best of" lists for the show. Sure, it's not a bad episode by any stretch of the imagination, but it's also not a super surprising one. 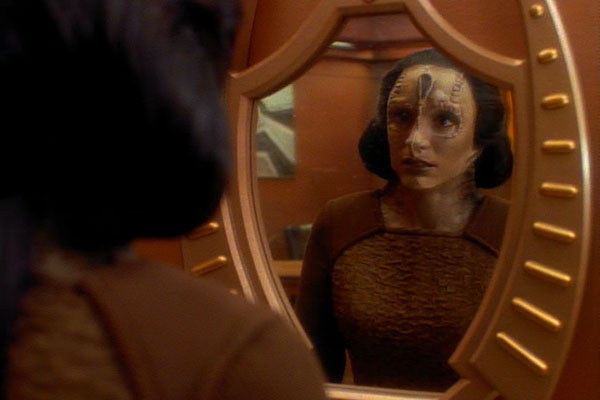 Having Kira get changed into a Cardassian is shocking for a few moments, but for me there was never any doubt as to if she was really a Cardassian or not. Sure, there are shows where a major character reveal like this would be permanent, where we'd discover that somehow, all along, they were actually a double agent. Star Trek, though, is not that kind of show. You'd need a Babylon 5 or Battlestar Galactica kind of show for that level of major character shifts. A show like Star Trek, though, doesn't bank on long-term serialization. 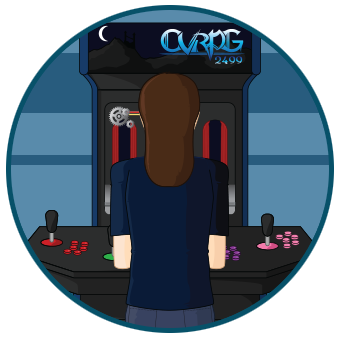 They want people to be able to pick up an episode here or there without struggling to keep up. Changing a major character like Kira would never stick on this series. Hell, when talking about long-term character changes, Discovery tried that and even though they set it up all season, the reveal that someone on the crew wasn't who they said they were (hell, that two different people both has secret agendas), felt ham-fisted at best. Maybe Star Trek just isn't the kind of series for that level of character reveals. Still, once you get over the fact that Kira would never be a double agent, much of the episode does work. Watching Kira struggle against the story she's being fed is interesting, and watching her Federation crew come to her aid has a certain enjoyable "rah rah" quality to it. Hell, they even manage to mine pathos out of Kira's supposed father, a man who honestly believes the Cardassian Kira is his long lost daughter. His plotline is quite effective. So no, while this isn't an episode I'd necessarily recommend as a "best of", it's still an interesting episode that does highlight some of the darker places the series was willing to go. 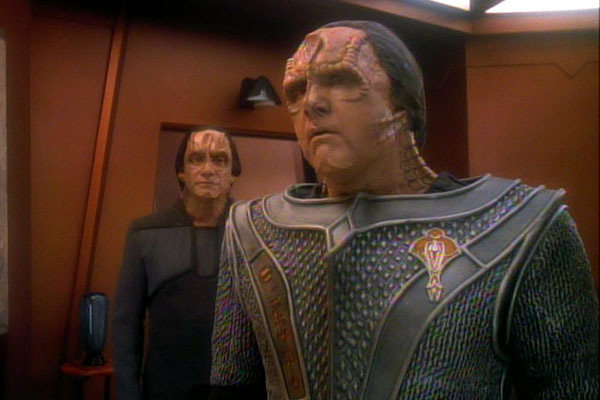 The Cardassian are not good people and, as this episode highlights, they will go a long way to try and keep order over their people. Quark, never call yourself "Uncle Quark" again. It's super creepy. In the B-plot, the Doctor and Garak bond. Garak has a lot of secrets, and the Doctor regularly pries at them. But hey, the two of them are fun to watch. Really good chemistry. Of course, then the B-plot ties into the A-plot and this becomes a tightly crafted episode. And apparently the Defiant is already at the space station, so we're already past the spaceship-less era of the series. The Cardassians use the same computer voice as the Federation. I wonder she took just any voice acting contract she could get? 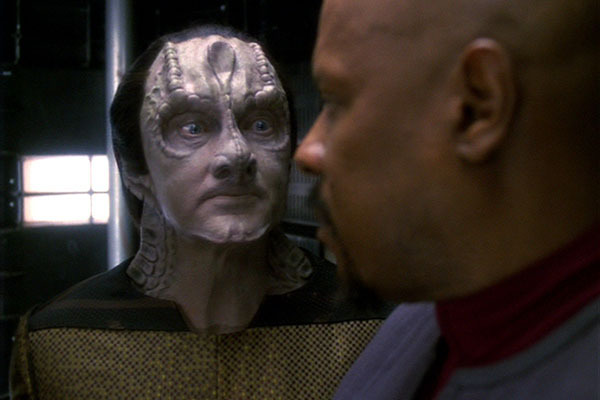 Seriously, Garak is the best character on this show. Can we get a spin-off focusing on him? Told in medias res, we open with Jake Sisko, and old man and years in the future, telling a visitor about the day his father died. On that day, Jake and his father, Ben (commander of the station and captain of the Defiant, of course), were on the Defiant to witness a rare event at the wormhole. However, something happens to the warp core and Jake and the Captain (which sounds like a 70s TV show) have to fix the engine. 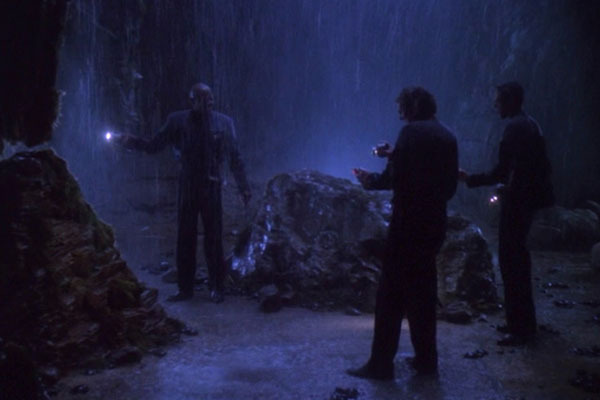 They succeed, but then something happens between the two and Sisko is seemingly disintegrated. Everyone, including eventually Jake, tries to move on. 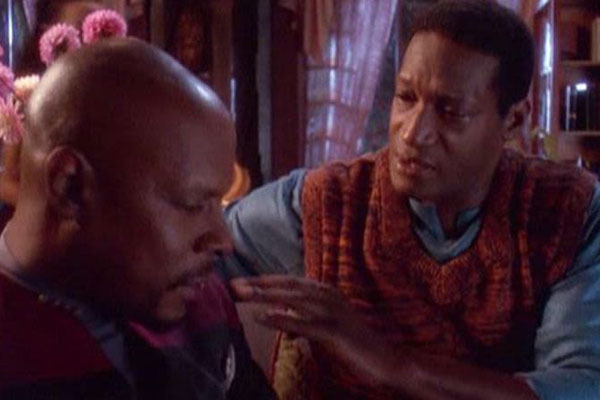 And then, a couple of months later, Ben Sisko magically appears right in front of Jake for a few seconds. He tried to shake it off, thinking it must have been a dream, and would have if nine months later that Sisko hadn't shown up yet again. Ben stayed for longer this time, and the rest of the crew tried to find out what was going on with him (something about temporal phase). Essentially, Sisko was bouncing out of time, without any way to control it. He eventually faded away again, and Jake had to move on at some point. Years and year passed before the next time Sisko appeared. Jake had become a writer, settled down, but the appearance of his father threw his entire life out of whack. It eventually became clear something had to be done to save Ben, and so Jake changes his life around. But could Sisko be saved before he was lost forever? I'm a sucker for a good time travel story, and this episode certainly has quite an interesting hook to it. Of course, traveling forward in time is considered the more realistic probability (go fast enough and time around you will move quicker while you effectively travel at a "slower" time). Sisko bouncing forward in time probably isn't all that realistic, and they never really do a good job of explaining the how or the math of it or anything, but, meh. It's still a good story. That's because the time travel mechanics are secondary to the emotional dynamic between Jake and Ben. For all the hookiness of the time travel conceit, the real story is the drama of a family throw out of whack by a science snafu. Ben is lost and Jake can't move on, and you feel for the two of them because both characters (and the three actors, with Tony Todd playing the older Jake to Cirroc Lofton's teenage Jake) are so deeply invested in their story. Jake's story is a sad on as every time he starts to let go of his Father, Ben shows back up. Each time he gets settled into a new life, it's disrupted, throwing off his writing career, his potential family, everything. Jake cuts a tragic figure in the story, making this one of the more bittersweet time travel stories I've seen. It's not schmaltzy, although it does come close. It toes that line, for sure, and maybe the overarching narrative of Jake talking to a young admirer edges over that line. Still, I like it for where it goes, the story it wants to tell. I can certainly see why it was nominated for awards as it's unlike most time travel stories you'll see. The makeup used to age Tony Todd wasn't really the best, but her performance was still great. 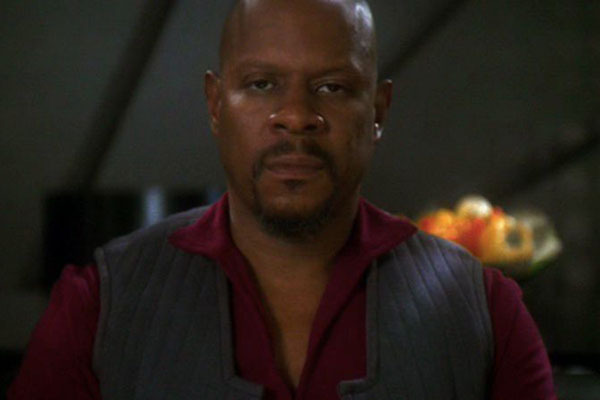 Damn, Avery Brooks is such a Shakespearean actor. Always just on the edge of over acting. It's a lot, but I still enjoy it. Very interesting "future" versions of the Starfleet uniforms. I do wonder if they're considered "Future Imperfect" versions. I was originally going to write about "Way of the Warrior", the first episode with Worf in the series, until I realized that was a two-parter. Next on the list for me would have then been "Call to Arms", the Season 5 finale, but along with that being a finale it's really the start of the whole serialized DS9 Dominon War, and if wasn't going to cover a two-parter the first part of what's essentially a seven-part arc. So, instead, we go to before the Dominon War for an episode centered entirely on a Klingon ship. In the lead up to the eventual Dominon War, General Martok (J. G. Hertzler), Klingon warrior station aboard DS9, receives orders from Klingon High Command telling him to take a bird of prey out to the to investigate the disappearance of another Klingon ship. He invites his friend, Worf, to come along as his first officer so he has someone he can trust at his side. And then Dax comes along to as a way to keep an eye on all of it, working as the ship's science officer. 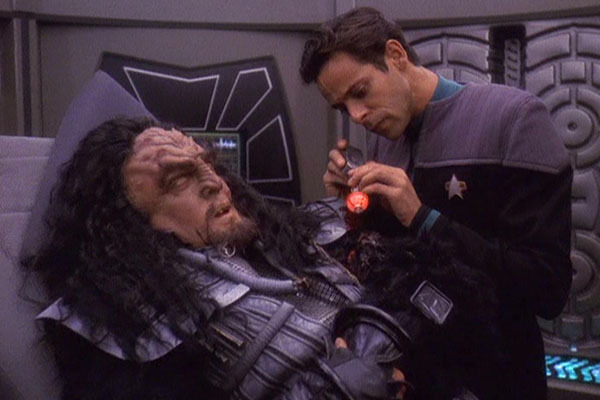 The problem is the ship is suffering from terrible morale with the crew doubting their abilities, and that includes the newly appointed captain, Martok. Worf and Dax will have to find a way to rebuild morale and aid their captain before all hope is lost. Perhaps I'm mistaken and someone can point out an episode I'm not remembering, but I don't recall any episodes before this that focused so heavily on the Klingons, following them on ship and watching hour their social dynamics on a Bird of Prey functioned. Sure, there were episodes and movies where we got some perspective on the Klingons, but usually it was as the aggressor, normally coming after a Federation ship (such as in The Search for Spock). To actually immerse us in the Klingons for the length of the episode, that's a rare thing. Better still, the episode does a good job of making them compelling. Sure, it's a little weird to watch, what with them being aliens that do things differently than we do, but I enjoyed the time spent with them. Their dynamic really felt like a pirate ship (something O'Brien in the episode notes), especially once they break into song, singing a ditty about Khaless (their great warrior and, essentially, god) and the glorious battles ahead. Sure, it's goofy, but somehow it works. Of course, much credit has to be given to Michael Dorn for selling the crap out of Worf during this episode. Although he came across as rather stiff in his early time in Next Gen, Dorn had the time to really craft Worf into a fully realized character, spending more time in the Trek universe than perhaps any other actor in the franchise (what with being in all of Next Gen, half of DS9, and all four Next Gen movies. He has this character down, and by this episode, Worf (still stiff, but in his own conservative way) is perhaps the most fully realized character in the franchise. Dorn is great in the role, and he brings real gravitas to his performance here. So yeah, while there might be other episodes that focuses on the Klingons in some capacity, this is probably their best portrayal. They may be warriors, but there's more to their social dynamic than that. Watching it here makes a compelling case for a series more focused on them and their lives (and no, I'm not counting their weird portrayal in Discovery). There's a whole lot of ceremony on a Klingon ship. A lot of pronouncements and declarations and singing. It seems like so much effort. Dax is a sassy dame. Oh, wait. That was your plan all along, Worf? Maybe try for a plan where you don't get stabbed next time. This was the episode I was waiting for. As much as it might be cheating to watch an episode I've seen several times before, this is the best episode of the whole run of Deep Space Nine and I wasn't skipping out on it. After posting yet another casualty report due to the ongoing Dominion War, Sisko realizes that the only way for the tide to turn is for the Federation-Klingon alliance to gain a third partner: the Romulans. So far a neutral party (about as Switzerland as Romulans could be), if the Romulans could be somehow forced to betray their neutral, non-aggression pact with the Dominion and actually join the war, it would be more than the Dominion forces could potentially handle. Thus, he hatches a plan, by hook or by crook, the get the Romulans into the war. Whatever it takes. And yes, that means he turns to Garak. When fans talk about the difference between Deep Space Nine and the Trek shows and movies that came before, the words bandied about are "darker" and "more mature". I don't know if I'd go that far per se, but DS9 is certainly a show that's willing to go to places that don't quite fit into the perfect utopian ideal Gene Roddenberry set out to illustrate. I have to think, with its tales of occupation, compromise, and war, Roddenberry wouldn't have been a huge fan of DS9, and he probably would have hated this episode. This particular story is all about compromise and no one comes out clean on the other side. Not Sisko, not Starfleet, and certainly not Garak (although that was never in any doubt for Garak). This is an episode that only Sisko could have starred in. Kirk may have cheated to win against no-win scenarios, but no one ever doubted his moral code. Lies and deception were one thing for Kirk, but it's hard to imagine him being a party to bribes and murder. And when it comes to Picard, even the lies and deceptions were probably a line too far for him. Sisko, though, viewed his job, his duty, differently, and while this is certainly the farthest over the line he'd ever gone in the series, it wasn't out of character for him to hatch a plot filled with crime upon crime. Not that it makes him a bad guy. He's just not a black and white good guy. And Deep Space Nine is not a black and white kind a show. Everyone's a little morally grey, and this episode wallows in it wonderfully. But what works best is that the show only ever goes here once. Sisko sinks to Garak's level, does what Starfleet officers shouldn't, and then comes out the other side. But he only does this once. The show never tries to pull this trick again. It's a one off, a fluke, and it works because the show knows where the line is and is only willing to cross it once. This is still Star Trek. We're still hoping for a perfect utopia. One compromise to get there is fine. Let's just never do it again. Dax does play a decent Devil's Advocate. That scene was pretty darn good. Gotta love a good Garak episode. He's always such a charmer. Those grey uniforms have to be very warm. A zip up shirt under a zip-up vest under a zip-up jacket, all in the thick uniform fabric. Federation ships and stations must keep their temperature quite cold. Oh, who hasn't wanted to kill Quark? Yay! Jeffery Combs. Any time he's in the show is a good time. While returning from a mission, the Defiant gets a general distress call from a downed lifepod from a remote sector of space. 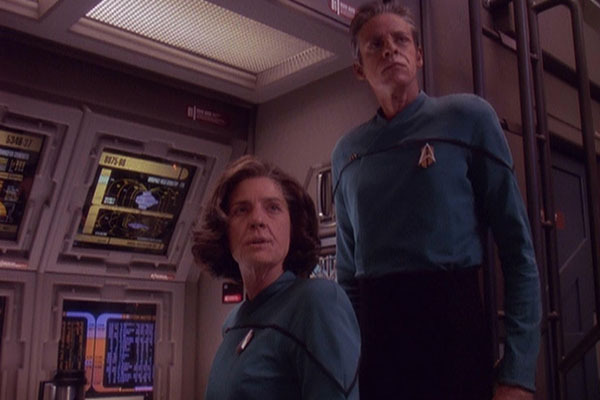 The planet in question is so far out it would take six days at maximum warp to get there, but the Defiant is the closest ship in the region, so she's immediately turned around to go save the crew: a single, female Starfleet officer, Captain Jane Cusick. While they travel, the various crew members have conversations with Jane, all becoming friends with her. Sadly, they have to get to her in time before she dies of CO2 poisoning. But will they? There are parts of this episode I really like, although I feel like it ends up edging over the line from well-written to schmaltzy pap. The Jane character, I think, is the biggest issue with the episode as she's just a little too nosy, a little too overly-friendly. Yes, I get that she's alone on a planet and has to talk to someone, but her dialogue doesn't feel like a real human being but a collection of tropes and lines strung together. The rest of the crew all handle their sides of the conversations great (because this is sixth season by now and they're all pros), but Jane just doesn't come across as real. The twist of the episode is interesting, though, and considering the dire straits the captain was in, I don't feel like it's a cheat. Sure, "blah blah particle barrier" and "timey-wimey" nonsense play a part, but this is Trek. It's an interesting ending, and feels earned, in a way. Better still is the B-plot of Quark and Odo. Quark notices Odo getting distracted whenever Kira is around, so he hatches a plan to get Odo out of the way for a night (a anniversary date for Odo and Kira after being together one month), so that he can hatch a little plan and make some money. It's not a huge plotline, with pretty low stakes for everyone except Quark, but it is enjoyable. Plus it shows a certain amusing chemistry between the Ferengi and the security officer. I ended up enjoying this plotline a lot more than the "main" plot. As a self-contained episode, "The Sound of Her Voice" is decent. You have to have episodes like this to blow off a little steam during long plot arcs. It's just not one I'd count among my favorites, especially not after a second viewing where I can really start to see the flaws. Let's all just agree upon the silent joy of Morn. Such a great running gag. That planetary barrier is just a whole bunch of technobabble. Not a bad toast to failure, Quark. Way to make your toast all about you, Julian. I do really enjoy this show. I like the nuance to it, the fact that the people aren't perfect but they keep trying. 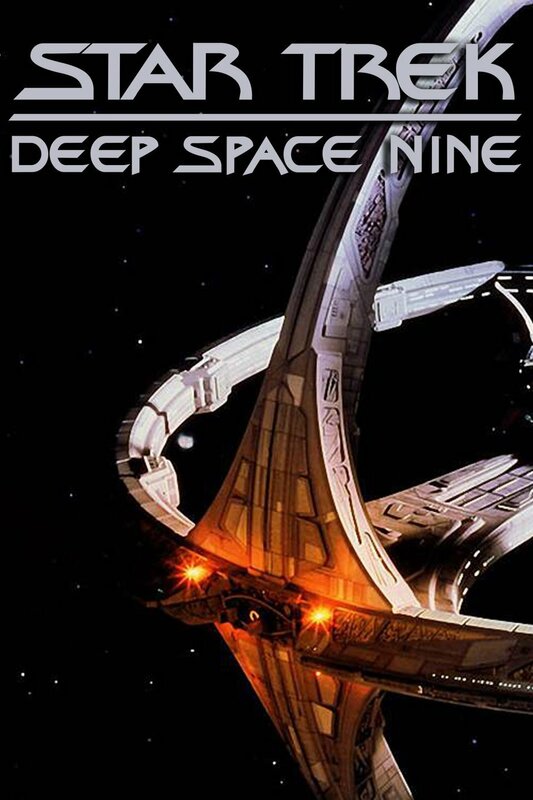 Deep Space Nine was also the first show in the franchise to really give us perspectives outside of the Federation, and it ends up feeling like an even strong ensemble because of it. Not every episode may be a winner (as evidenced by the last episode we watched above), but on the whole even the "stinkers" are still pretty good. Of all the shows bearing the name "Trek" this is the one I end up going back to regularly.